I asked Brandon to work with me on this post, I wanted to get his thoughts on Valentine’s Day, and his first response was “cool, yeah, but don’t call it Valentine’s Day date ideas or something, that sounds so cheesy.”;) #noted. If you know me well enough, you know I love any excuse to celebrate, even if that just means staying in & planning something fun. 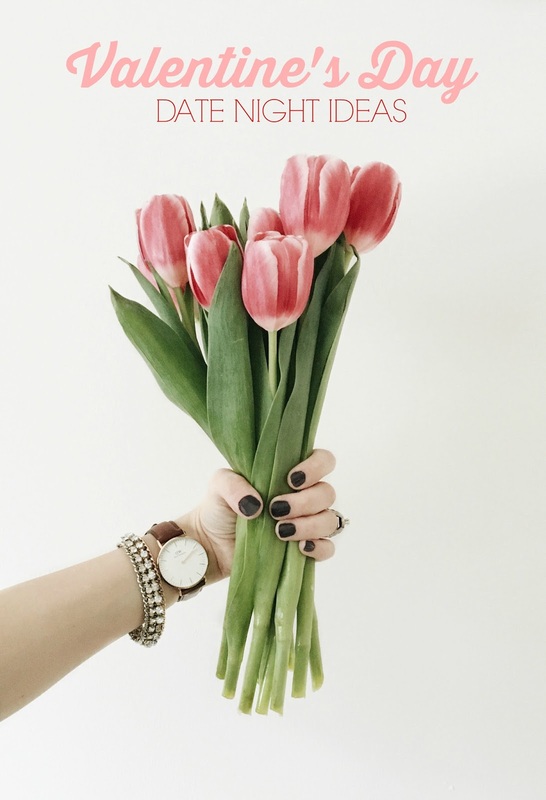 So, together, we came up with this list of five fun ways to spend your Valentine’s Day! Watch by Daniel Wellington // Use coupon code Garvin2016 for 15% off your purchase! 1. Movie night! The obvious, easy date night. But spice it up a little bit, blow up an air mattress on the living room floor, order pizza or Chinese food & rent something you both want to see! Try Martian if you’re looking for something new, Valentine’s Day if you want something romantic & festive, or Wedding Crashers for a good laugh. 2. A Valentine’s Day Feast Challenge! We love cooking together, and it’s super therapeutic! Head to the grocery store with a $20 bill each, split up & pick out whatever you can come up with, using only that money. Then using only the ingredients the other person bought (and spices you may have at home) you must creatively cook a meal for them. Take your time cooking, throw on some good tunes & don’t forget the wine. 😉 And wherever you decide to eat your meal, don’t forget to string up some leftover Christmas lights just for the fun of it. 3. Dress up & go try a new restaurant. It’s easy to get in habits of eating at the same places (ahem, chipotle) but it’s so fun to be in new environment & try new food. Maybe even order for each other. And if you don’t feel like dressing up? Throw on your pajamas & head to your favorite breakfast-for-dinner restaurant, you can never go wrong with pancakes. 4. Grab a cocktail, a coffee or even your favorite snack, and take turns playing songs from your favorite playlist that you both put together ahead of time (or impromptu picks!) Maybe songs from when you first fell in love, or songs that you just can’t help but get up and dance to! This is one of our favorite stay-at-home date nights for after the kids go to bed. 5. Flowers aren’t really your thing? Spend the evening picking up a few bouquets of flowers, or even splitting them into mini-bouquets & drive around to deliver to others! Maybe that is your mom or grandma, a friend who has lost a loved one or is going through a tough time or just someone sweet who might need a little pick me up. Giving is always better than receiving, and we can bet you’ll feel extra warm & fuzzy inside with this date night idea. Brandon & I have been married for over seven years & were high school sweethearts. It’s kinda crazy to look back on all of our years together, and at the end of the day, one major thing stands out. We have always made it a priority to make time for our relationship. Life is crazy and chaotic, work & kids consume our every day. But not a single week goes by where we don’t get to kick back with a drink, hold hands & laugh about something. We text love notes, make each others coffee, and go out of our way to do little things that make each others life a little bit easier. Not to say that marriage doesn’t come with its fair share of struggles & arguments, I could probably go on all day about things we disagree on or fight about. But that’s not what relationships are about! 😉 So may Valentine’s Day be a little reminder to focus on the good, to celebrate all the things there are to love about eachother & to have a little fun. I love this! I love getting a little glimpse into other people's relationships and how the keep them going strong, it seems like people don't like to write about them much or talk about dates but this is just perfect! Our go-to date night at home takes place after our 2-year-old is down for the night. We make loaded vegetarian Nachos,drink a good craft beer, and play a board game (Ticket to Ride is our fave)! Then we throw on a movie and eat some Jeni's ice cream for dessert. My husband and I are high school sweethearts too, been together now for almost 15 years. You are so right about making the marriage a top list priority! Now with a 9 month old it means really making the effort! Last year Travis made me a delicious dinner at home and had me dress up (I was six months pregnant and didn't feel like going out!) we ended up having dessert on the living room floor and dancing and watching a favorite movie together! It was so sweet a night out wouldn't have compared! This year we plan to be home, with our baby boy and make homemade heart shaped pizzas (ala your blog!) and try out the califlower crust that is all the paleo rage! And movie night too!! Love your ideas! Especially the one like guys grocery games! Wonderful post, Jessica!!! I love that you two prioritize each other! My husband and I are just like that, too. At the end of the day, he's the one I want to be with. And I love how you said that it's important to focus on the good. No marriage is easy, but every single person has unique, incredible attributes. I have been focusing on only those in my marriage and it has been life-changing. Thanks for the fantastic ideas!! We will definitely be doing an at-home date night since we have little ones. Haven't quite decided what yet, but I love all of your ideas! I love the idea of cooking with what the other person buys! Outside the house date: Go try a new activity together. One time we took a glass blowing class and another time we took a trapeze class together. Both were fun and memorable. We still have items from the glass blowing class one heart I put out every Valentine's day and one Easter egg we put out ever year during that time. We actually video taped a portion of the trapeze class together. So fun to watch afterwards. Inside the house date: Read a book together aloud and discuss it this of course would take place over a series of nights or play a board or card game or a play a video game together (I know a lot of husbands who would be stoked to have their wife play a video game with them). Or set up some canvases put on some music and paint together. An abstract painting is awesome and relaxing. What a great list! We love making cocktails, turning on a mindless show, and playing a game of dominoes. Hope you have a great Valentines with those sweet girls and the hubs! I love this! My husband and I never have the time or funds to do all the things most people suggest – go carting! cooking classes! a fancy hotel! but these are all so sweet and down to earth. Thank you for sharing and for always being so festive. This is an incredibly beautiful space to have a wedding reception. The space at wedding venues Los Angeles is a long hall with a few side rooms (perfect for dancing and hor d'oeuvres). The windows at the end of the hall led to magnificently gorgeous panoramic views of the city.